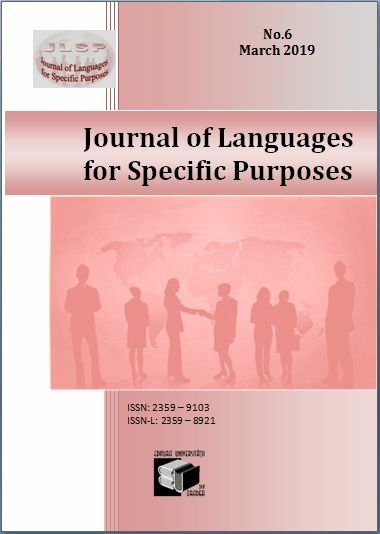 The Editorial Board of the Journal of Languages for Specific Purposes (JLSP) – Oradea University Press – will implement a double-blind peer review process and is seeking for individuals to review papers submitted. The continuous increase in quality of JLSP depends on volunteers taking a few minutes of their time to read papers submitted and giving a thoughtful review. Being a reviewer is a matter of prestige and personal achievement. The accepted applicants will be considered as members of the “Editorial Review Board” (a peer reviewer for papers submitted to JLSP) and will be mentioned on a special acknowledgement-area of our website: http://jlsp.steconomiceuoradea.ro/editorial-review-board/. Peer reviewers are expected to help build and maintain the reputation of the Journal “Journal of Languages for Specific Purposes” by identifying exceptional and timely papers. Engaging highly qualified reviewers with expertise and experience in content areas and topics defined in the Call for Papers is essential to the future success of the aforementioned journal. Efforts of reviewers are the key for the objectives of a fair and timely review process for all the papers submitted to the journal and the publication of papers of the highest quality only. We greatly appreciate the reviewers’ efforts and are truly grateful for their help. We look forward to receiving your Reviewer applications and kindly ask you to disseminate this Call for Reviewers to any colleagues or contacts you think may be interested. All applicants must fill in the Reviewer Application Form online. For assistance with questions regarding this Call for Reviewers, please e-mail jlsp@steconomiceuoradea.ro. Contributors are asked to submit a full paper not exceeding 5000 words in length, including abstract, figures, references and appendices for a total of 10 pages, which have to be written in English, French, German or Italian – with the abstract in English. The paper must comply with the Model paper, available at http://jlsp.steconomiceuoradea.ro/wp-content/uploads/2013/06/JLSP-model-paper.docx, that explains all the requirements in detail. The Editorial Board considers all full papers that are received by the established deadline. Academic researches, post-doctoral researches, PhD researches, case studies and work-in-progress are welcomed approaches. When the full paper is submitted, it is double-blind reviewed by members of the Editorial Review Board of the Journal of Languages for Specific Purposes (JLSP) to ensure an adequate scientific standard, that the paper is of a suitable length, the standard of the language used is adequate and the paper is appropriately referenced. The double-blind review focuses on several issues intended to ensure that the paper is relevant to the JLPS goals and objectives, is of a sufficiently high quality to be accepted for publication in the JLPS. The review form/s will be sent to reviewers together with the paper/s and has to be returned filled in within the deadline specified (2 or 3 weeks). Each reviewer will receive via e-mail a range of up to 3 submitted papers to the JLSP, by January 15 of the publication year, and will need to complete off‐line double-blind evaluations no later than February 8. Please note that volunteering as a peer reviewer represents a significant time commitment and responsibility for ensuring timely and thorough reviews of all assigned papers. Reviewers are eligible to contribute their papers to JLSP. They are prohibited from reviewing papers submitted by professional colleagues employed by the same organization. In the event that a reviewer rejects a paper, a second opinion will be requested and the the Editorial Board will make a final decision regarding the acceptance of the paper. After the double-blind reviewing process, the Editorial Board sends a notification e-mail of paper/s acceptance or rejection to the author/s. The author/s whose paper/s is/are accepted will receive the notification of paper/s acceptance (with any requested changes after the double-blind reviewing process). The papers accepted (after the double-blind review evaluation process) will be published in the Journal of Languages for Specific Purposes (JLSP), Oradea University Press. All published papers will be also available, with free full text access, on the site of the journal. Reviewers commit themselves to assist the Editorial Board in the editorial decisions regarding the suitability of a paper for publication in the JLSP. Manuscripts will always be evaluated only based on their intellectual merit and contribution to the aims and scope of the JLSP, as the reviewers should adhere to standards of fairness, integrity, and objectivity. Kindly note that personal criticism is unacceptable. Reviewers who feel that their review comments might be biased and/or unqualified regarding a particular manuscript submitted for publication to the JLSP should notify the JLSP Editorial Board immediately and excuse themselves from the review process. Reviewers warrant that they will not use the manuscripts and related materials submitted to the JLSP for any other purpose other than the double-blind peer review process without the JLSP Editorial Board´s and/or author´s permission.